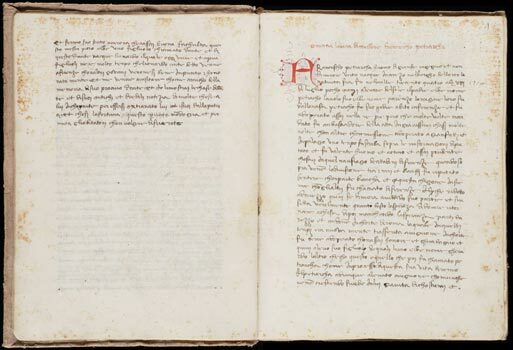 Petrarch’s lofty place in the development of humanism in the urban vernacular context is illustrated in MS 329, which begins with Leonardo Bruni's life of Petrarch (together with that of Dante); the Italian translation of Petrarch’s letter to Niccolò Acciaiuoli appears later in the manuscript. The Petrarch-centered texts are joined by numerous other letters and public speeches by various authors, forming an anthology to extol civic honor and responsibility. All the texts are translated into Italian, and they are mainly focused on civic life in Florence. A number of other 15th-century manuscripts, including the Beinecke Library’s Marston MS 247 (also in this exhibit) contain the same or similar texts, in Italian, showing how the Latin humanistic tradition spread into the vernacular (Italian) world of the 15th century.